The bedroom is our private heaven but in the same times we want to design it elegantly to catch the eyes and to please you during spending your time there reading, relaxing or even sleeping comfortably. So when decorating your bedroom you will care about every detail to achieve the dream look you admire. What about trying new design trends to have a modern and luxurious look? The new trends nowadays are to combine colors together. As we all already know there is no better colors’ combination than the black and white one. Black is the master color of the color pallets and white is a neutral color which they both can be blended with any other colors. So you can also add other colors with them inside your bedroom to feel cheerful with your bedroom colorful atmosphere. How to apply this wonderful pleasing décor inside your bedroom? It can simply be applied by few and easy tips. You first need to consider the bed as the bedroom focal point, you can get one in black add some stripes of white or vice versa. 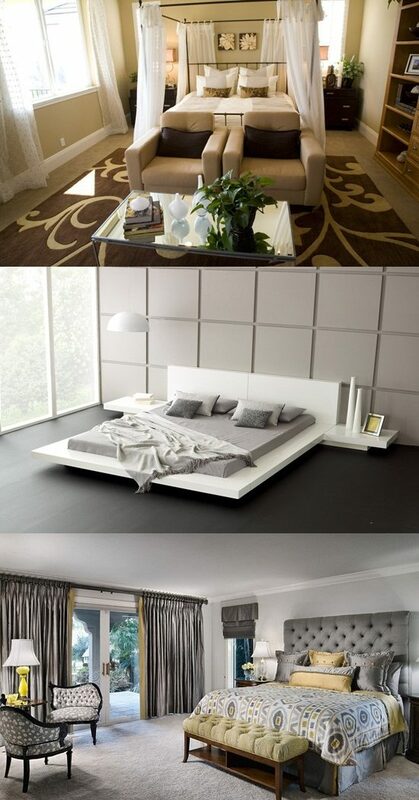 Never forget also to get the matching complement furniture like wardrobe, side tables, and others. Then for more spacious look and to brighten up your bedroom, you need to paint all the room in white and you may consider one wall in different color like the light blue or even better decorate the wall by colorful wall art. You can blend other colors inside the bedroom like yellow, pinks, red, and more by the accessories as a curtain, bed covers and pillows, area rug, vase, shaped table lamps and more. The lights also for the bedroom is essential to highlight its beautiful look as you install different light types which will brighten up the overall look like the ceiling lights, accents lights and colorful sconces for wall or flooring. Take a deep look either online to have more ideas and check the credible stores which you can get your items and then decorate your bedroom as perfect as you desire.